Over the last century, scientists have struggled with a lingering question in geology: Why do the structure and elevation of some mountains continue to evolve long after the tectonic forces that formed them cease? Using a new model to explore the undercurrents of mountain landscapes, Assistant Professor Sean Gallen from Colorado State University found that there is an ebb and flow of activity in these mountains, even in places that are tectonically inactive or past the point of mountain "building." Gallen's study, which analyzed peaks in two of the most visited national parks in the United States, the Blue Ridge Parkway and the Great Smoky Mountains, puts to rest a century-old debate over the westward course of the Tennessee River. Based on the findings, Gallen said this river system diverted from a more direct southerly route to the Gulf of Mexico about 10 million years ago. The river's reorganization can be traced to erosion and is reflected in the DNA of fish and salamanders in the waterway. This suggests a link between mountainous landscape dynamics and the evolution and diversity of aquatic species. The study, "Lithologic controls on landscape dynamics and aquatic species evolution in post-orogenic mountains," was recently published online in Earth and Planetary Science Letters. Traditionally, scientists thought that rugged mountainous terrain is slowly and steadily worn away to a flat surface when a tectonic episode ends. But Gallen discovered that mountain landscapes are quite active due to variations in the strength of the underlying rock. He used modeling techniques to uncover the impact of the erosion of harder rock in these national parks. Gallen found that when harder rocks erode, exposing softer surfaces, waterfalls form at geologic contacts. "This increases the erosion rates and rejuvenates the landscape," Gallen, a researcher in the Department of Geosciences, explained. And when the waterfalls make their way to a watershed divide, the divide will migrate in the direction of the lower erosion rate. "This has a cascading effect, enhancing the erosion rates of one basin but, in the other, reducing those rates," he explained. 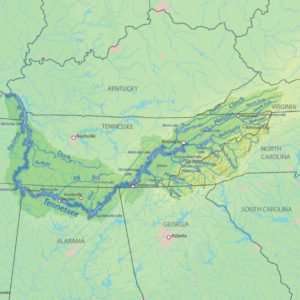 Gallen said this novel finding helps explain the long and winding path of the Tennessee River system, which flows from the Appalachian Mountains and takes an abrupt turn to western North Carolina and eastern Tennessee. The river then meets up with the Ohio River and empties into the Mississippi River. "This is one of these irregular features people have been curious about," said Gallen. "It's unusual to see a river take this long path. Something happened; it used to flow directly to the south." The scientist also found geological evidence in the upper river basin of a relatively recent diversion of the river's course—dispersal of sediment in the Gulf of Mexico. "Even though it's a longer travel distance, with the modern configuration and rock types, it's the path of least resistance," he said. "The river is 'happy' in this position." Based on his analysis, Gallen is now teaming up with biologists and other scientists to delve more deeply into what he has uncovered. "This debate about the Appalachian Mountains has been going on since 1894," he said. "I'm most interested in uncovering what's caused these disruptions." The Tennessee River basin has the largest diversity of freshwater fish in a temperate climate in the entire world. Outside of the tropics, it's a very important place to study biodiversity, and researchers have been analyzing the DNA of small minnows known as darters found there. It is well-documented in biology, but not understood, that 10 million years ago, there was a spike in divergence of this species, along with several other aquatic species. Gallen said it's possible that the waterfalls act as barriers; fish can go down the waterfall but cannot go back upstream. This could help explain why there are so many different lineages of these species, over time.